Santa seems to have traded his eight (nine?) tiny reindeer for hundreds of high-torque horses. A pair of holiday shoppers stop in, pondering the purchase of a yuletide ride. Don’t know if their son is more excited over the toy cars or over the custom cycles, but I’m sure either way he’s anticipating an awesome sleigh ride. Our Suncoast Diecasters December 2015 meeting was fantastic. First and foremost, Marge returned and helped us close out the year with her wonderful presents presence. Many great trades took place. And the fellowship and holiday spirits were richly flowing, ending our year on a great high note. Before getting to the photos, Let me inform you of the updates. First of course, Santa’s Cycle Shop has been added to our Christmas Panels page (which also features an improved video). Next, our Calendar now reflects our complete schedule for 2016. Also, unlike the last few meetings, to which I’ve brought anything but cars, I actually brought cars this time — and I can prove it. And finally, you’ll notice that a few of the items on our menu bar now have double arrows (>>); this is to more clearly indicate that those items have sub-menus which will pop out when you hover your mouse pointer over them. You may have noticed I refer to two Suncoast Diecasters members (not the ones above) as Original Ken and Emergency Back-up Ken. This is not only because they’re both named Ken but also because they both collect garbage trucks. EBU Ken had at our December meeting two new trucks and one he’d mentioned to me and brought in to show me. 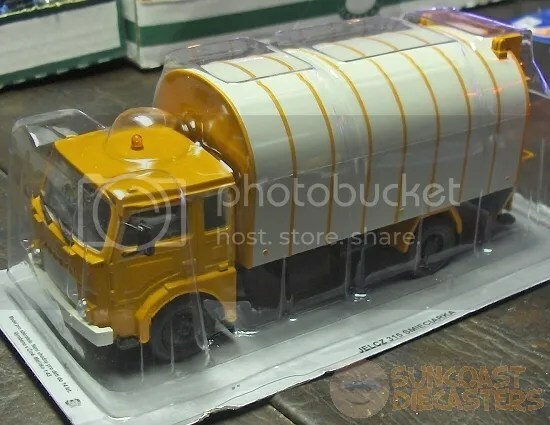 The first is this massive Jelcz 315, at 1:43 scale. Jelcz is a Polish manufacturer; this model is by IXO. 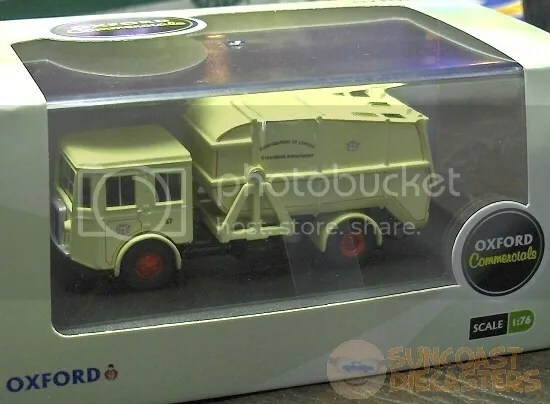 Next is this 1:76 scale Shelvoke Dewry by Oxford. The text along the side says “Corporation of London/Cleansing Department”. And finally, this little fellow which Ken said is a Transformer which he couldn’t figure out how to transform. 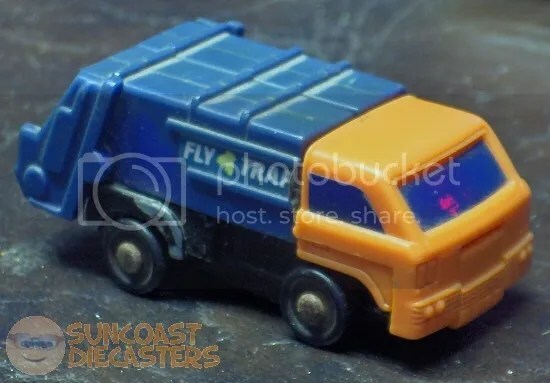 I noticed on the side the name FlyTrap, and advised Ken that this is actually a GoBot. I know this because I actually have this one myself. I told him not to worry, I would change it to robot mode after taking this shot of it in vehicle mode. Much to my embarrassment, I couldn’t remember how to change it. I got a few smaller parts loose, but I was afraid I’d break something if I kept trying to work the larger parts. So, I handed FlyTrap back to Ken in defeat. Naturally, the Internet provides plenty of photos to further humiliate me. FlyTrap is an evil Renegade, so OF COURSE he would embarrass me in front of Ken. Jim bought these two well-dressed vehicles from me. These are examples of a curious — and somewhat frustrating — element of collecting: the costly losses. 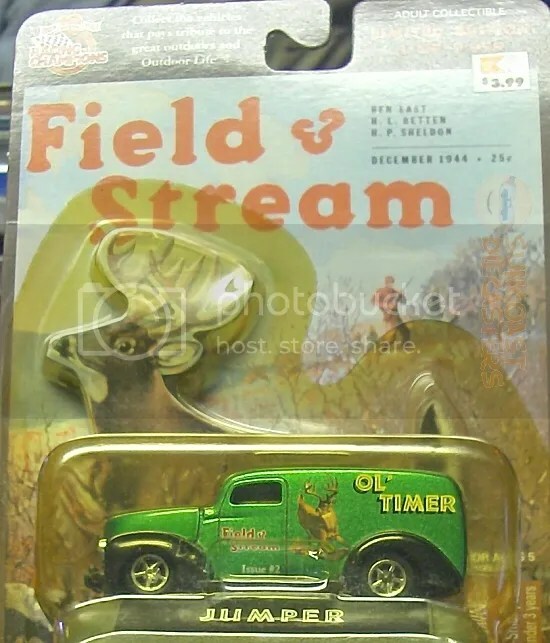 Aside from the fact that the models themselves are of higher quality than mainline dollar-cars, they’re also package with eye-catching backers which make great displays for those collectors who keep the packages, uh, packaged. Yet, here they amongst my for-sales, because I had eventually lost all interest in them. So, Jim gets two sweet cars for a bargain, and I get more empty space in my whatever I’m storing the rest of my cars in. …And then later on did me the favor of buying up all my remaining cars so’s I wouldn’t have to pack them all back into my travel bin. In the insert on the left, you see the last two full columns of cars on my table, and on the right, Mike’s big beefy hand swooping in and scooping up the top end of another column. …Maybe Mike thought my cars were all from a Star Trek episode? 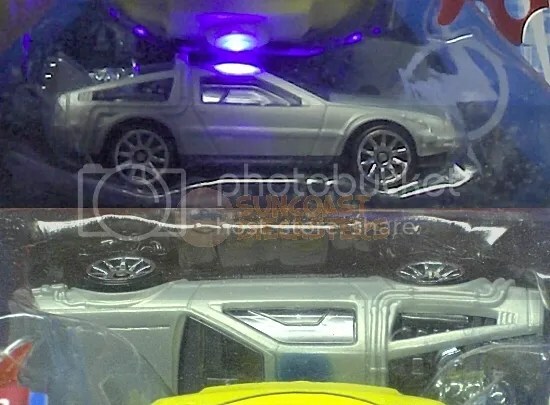 As a Big Tractor Holiday Treat, Mike RAOK’d me with this Light Speeders edition of the Back to the Future DeLorean DMC-12 Time Machine vehicle car toy (he just kept on typing). 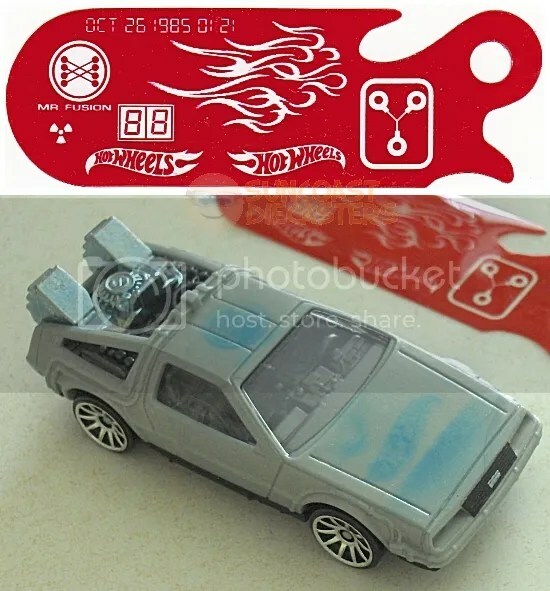 LS models have the cute and rather gimmicky gimmick of having a UV-reactive coating which responds to the included flux capacitor mini UV flashlight. Time travel at the speed of light! …I guess. 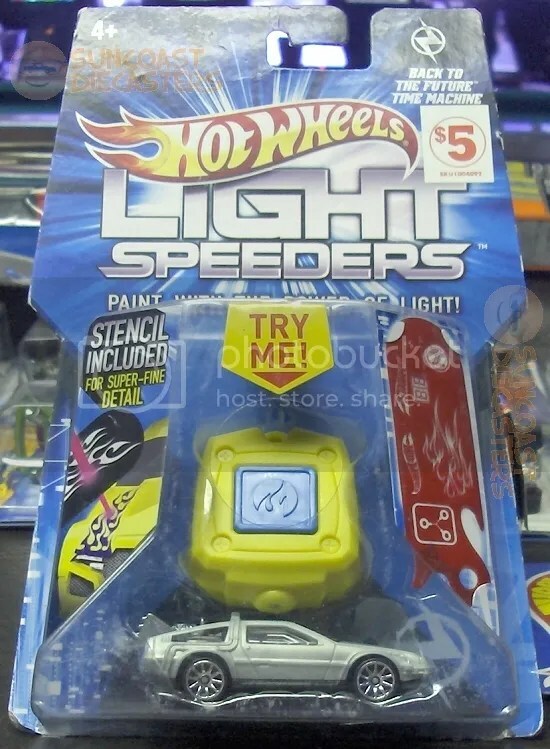 The Light Speeders series was produced in 2012, so it’s surprising that the battery still works (just like last month). Conveniently, the UV reaction also still works. See the bluish smudge on the roof in the lower half of the photo? You are looking at SCIENCE, boys and girls! Ken got several holiday treasures. 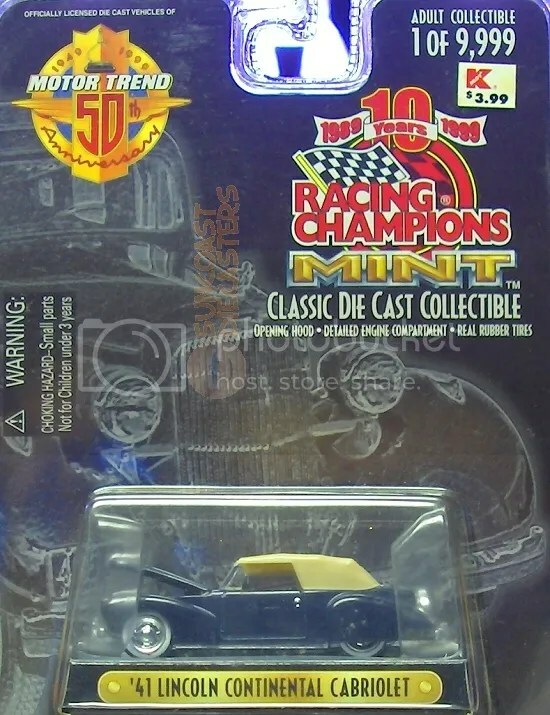 Here, we see (clockwise from bottom left) Racing Champions ’57 Plymouth; two Mustangs made by Fleer; two Majorette Morgans; and a Revell ’48 Chevy. 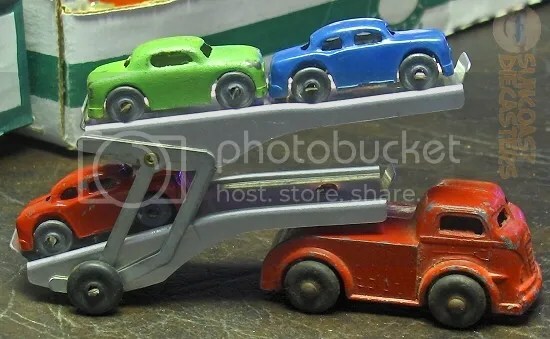 Next, we have (clockwise from bottom left …ish) a Road Champs Ford Model A; a Norev Minijet truck; a Norscot bulldozer; and a no-name Corvette with lights on the base. In this pic, Ken has (clockwise from bot– Sorry.) a Barclay car hauler “just like the one I cut my fingers on when I was a kid.” (That’s actual text from Ken.) The Barclay was available in single- and double-deck variations. I’ve found many photos online, but very little info. You are welcome to assist, gentle readers! And finally (clockwi– Dang! Sorry. 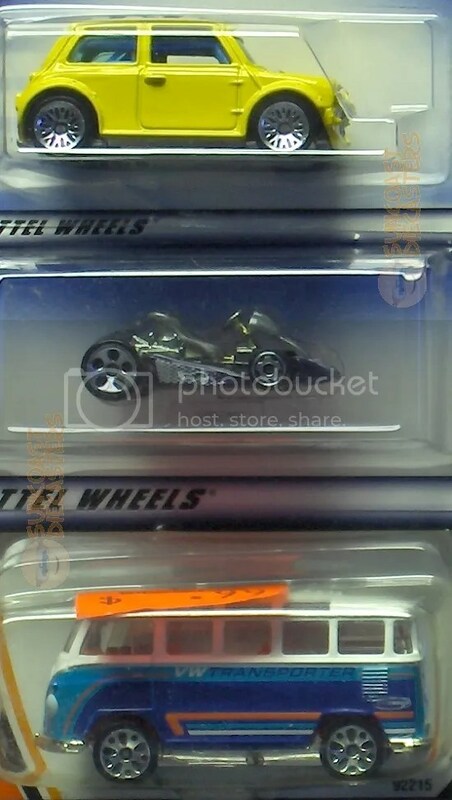 ), this ’53 Cadillac Eldorado made by High Speed, and a black pickup made to look like a Hot Wheels model but which is really a no-name butane cigarette lighter. Oh, you don’t believe it’s a lighter? 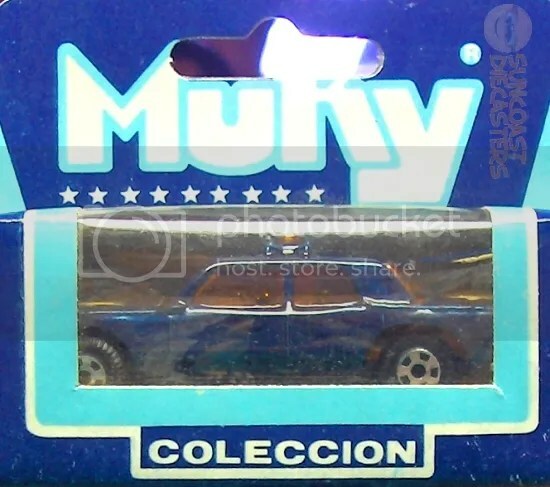 Oh, almost forgot: Ken also nabbed this Muky patrol cruiser from Big Tractor Mike. 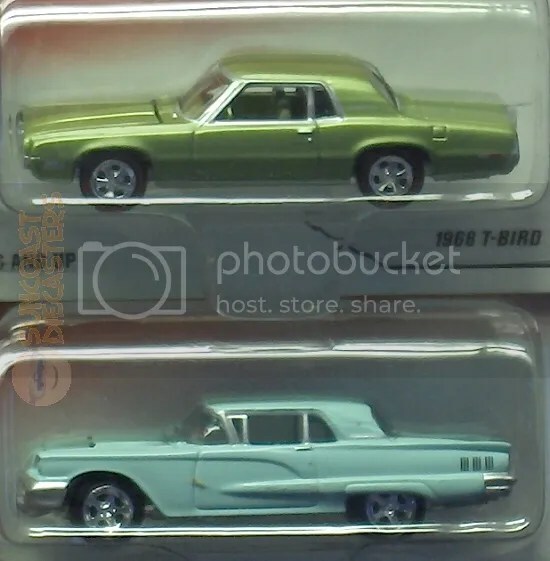 From Marge, Big Tractor Mike bought this 1968 T-Bird and 1960 Thunderbird Hardtop, both by Johnny Lightning. Thunderbirds are Go! …-Ing into BTM’s collection. From Marge, I purchased this Ford Zodiac Mk IV (not Ford Prefect). I was looking it over intently, when Jim mentioned something about a “spare”. I lifted the hood, er, bonnet, and thar it is! An actually spare tire, er, tyre! And I don’t mean a tire-shaped portion of a cast engine insert, I mean an actual separately-molded plastic tire! 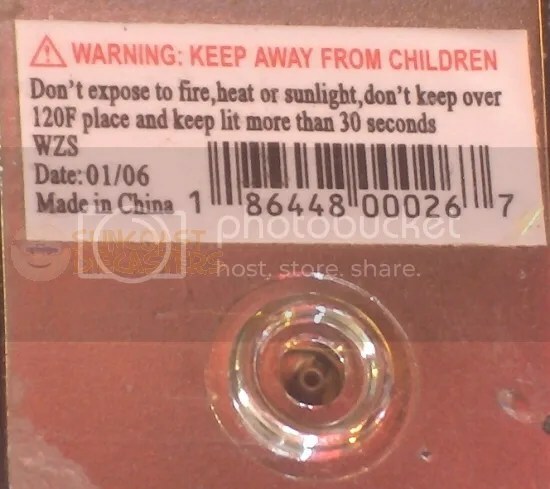 ‘Twas the selling point for me. 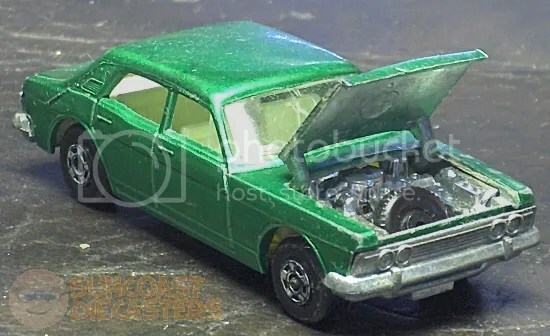 For its British historical aspect, its rare-enough opening hood, and especially for its thoughtfully-included spare tire, I hereby declare this Ford Zodiac Mk IV to be Suncoast Diecasters‘ Find of the Month(*) for December 2015! And now, for your (slightly delayed) Christmas Bonuses! See you at the January (2016!) meeting! This entry was posted in Christmas, GoBots, Muky, Transformers. Bookmark the permalink.